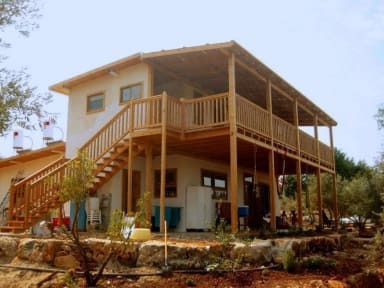 Clil guest house is located in the center of Clil, the first ecological village in Israel (1971). The village is not connected to the main power line and all electricity is manufactured from the sun or the wind. 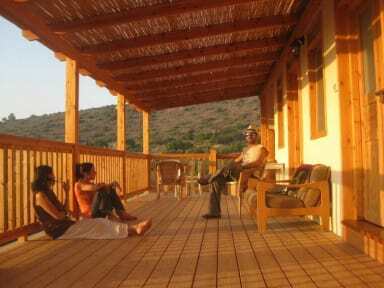 The guesthouse is built in an olive grove surrounded by natural bush and forest. It is a perfect place to breath fresh air and hike in the hills and valleys only minutes away. The guesthouse has two double bed private rooms and one 4 bed dorm room. All rooms are exceptionally clean and bright. There is a common shower with hot running water. If you are fond of cooking or prefer to cook your own food, we have an equipped kitchen facility. We also offer veg meals at reasonable prices. If you prefer to eat outside - Clil Cafe (opened on weekends)is only two minutes walk from the guesthouse. There are also other restaurants available, all in walking distance.